The ECM turns on or off the fan relays using signals calculated from the engine coolant temperature, air conditioning (ON/OFF), air conditioner refrigerant pressure, engine speed, and vehicle speed signals. 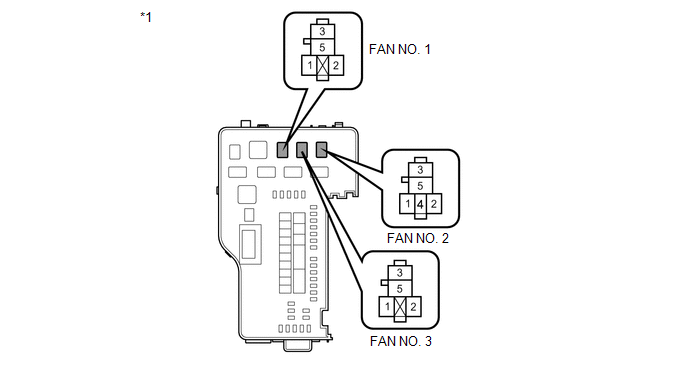 The ECM switches the circuit of the cooling fan motors between series and parallel by turning on or off the fan relays in order to control the speed of the cooling fan motors in two steps. Refer to System Diagram (See page ). (d) Enter the following menus: Powertrain / Engine / Active Test / Control the Electric Cooling Fan. 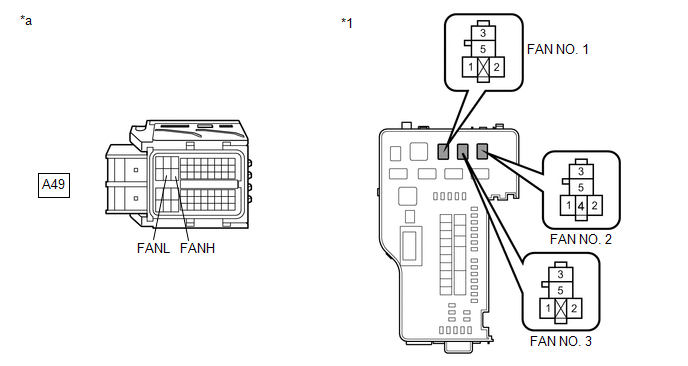 (e) Check the operation of the cooling fans while operating it using the Techstream. (a) Remove the FAN NO. 1, FAN NO. 2 and FAN NO. 3 relays from the engine room relay block and junction block assembly. (d) Reinstall the FAN NO. 1, FAN NO. 2 and FAN NO. 3 relays. (a) Remove the FAN NO. 1 and FAN NO. 3 relays from the engine room relay block and junction block assembly. (c) Reinstall the FAN NO. 1 and FAN NO. 3 relays. (a) Remove the FAN NO. 2 relay from the engine room relay block and junction block assembly. (c) Reinstall the FAN NO. 2 relay. (a) Inspect the No. 2 cooling fan motor (See page ). 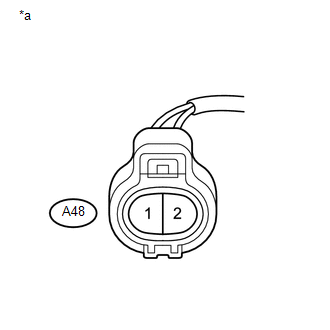 (a) Disconnect the No. 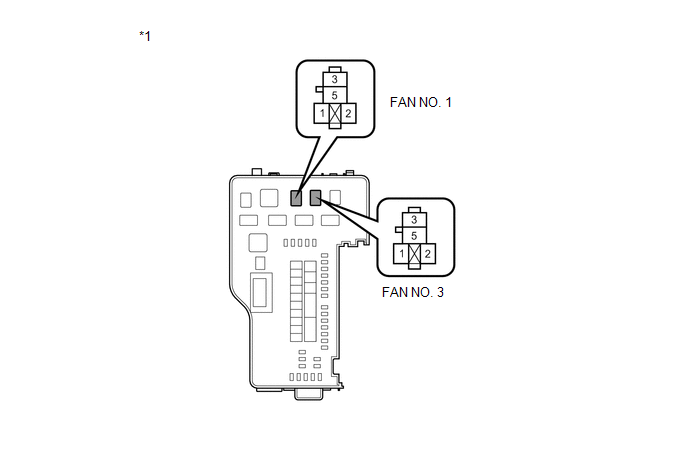 2 cooling fan motor connector. (c) Reconnect the No. 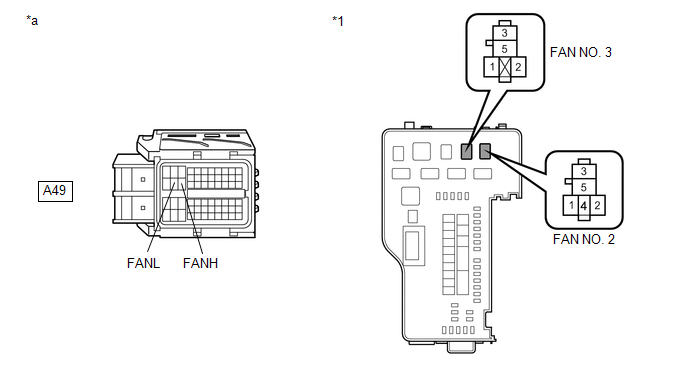 2 cooling fan motor connector. (b) Remove the FAN NO. 1 and FAN NO. 2 relays from the engine room relay block and junction block assembly. (d) Reconnect the No. 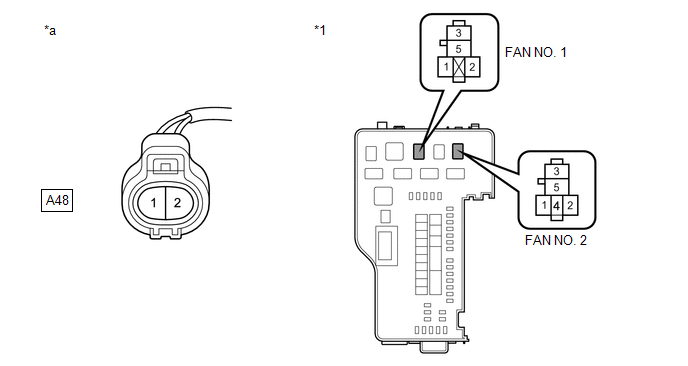 2 cooling fan motor connector. (e) Reinstall the FAN NO. 1 and FAN NO. 2 relays. 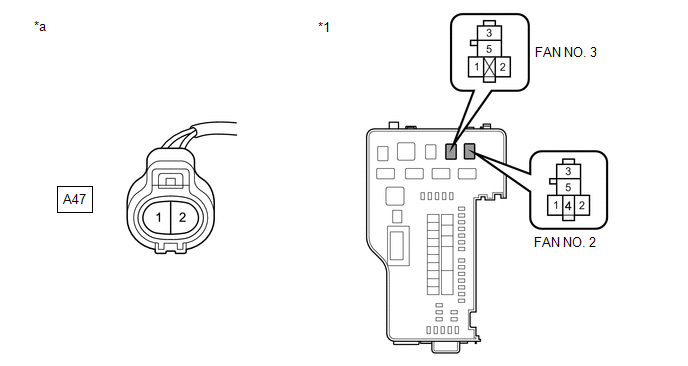 (a) Disconnect the cooling fan motor connector. (b) Remove the FAN NO. 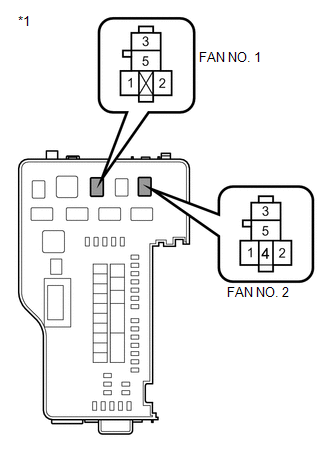 2 and FAN NO. 3 relays from the engine room relay block and junction block assembly. (d) Reconnect the cooling fan motor connector. (e) Reinstall the FAN NO. 2 and FAN NO. 3 relays. (a) Remove the FAN NO. 1 and FAN NO. 2 relays from the engine room relay block and junction block assembly. (c) Reinstall the FAN NO. 1 and FAN NO. 2 relays. (a) Remove the FAN NO. 2 and FAN NO. 3 relays from the engine room relay block and junction block assembly. (d) Reinstall the FAN NO. 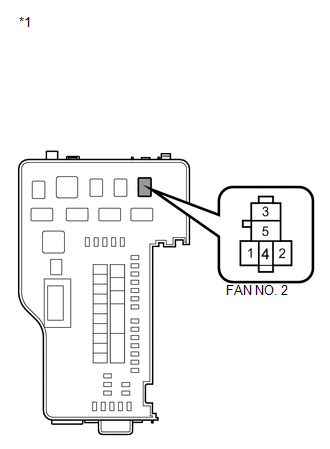 2 and FAN NO. 3 relays.